The main center of past volcanic activity in Arizona is northeast of Flagstaff around the San Francisco Peaks, which include the highest mountain in the state, 12,637 foot Humphreys Peak. 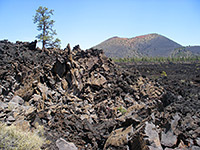 This is the largest of around 600 volcanoes or cinder cones, together with lava and ash deposits, that cover an area 50 miles across, and one of the most interesting sections is contained within Sunset Crater Volcano National Monument. 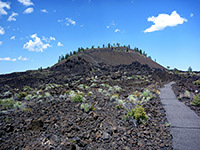 This has several short trails, one to the top of a cinder cone, but not up Sunset Crater itself (an especially tall, symmetric and colorful cone), to avoid causing erosion of its steep sides. 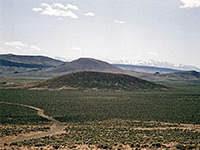 Adjacent O'Leary Peak can be climbed, however, while other sites in the vicinity include Red Mountain, which has a range of intricately eroded volcanic formations. Thirtyfive miles southeast, a rather different crater rises a little way above flat desert surroundings near Winslow; this is the Meteor Crater, one of the best preserved meteorite impact craters on earth. 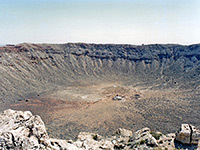 The crater is a privately owned attraction, very popular in part due to its easy access from I-40. The only other volcanic areas in Arizona are in the southeast, where erosion of ancient ash and pumice has resulted in the strange spires of Chiricahua National Monument, and in the north, around the Colorado River towards the west side of Grand Canyon National Park. 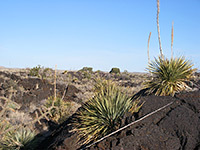 Features here may be viewed along the road to Toroweap, and the steep Lava Falls Trail. California has two major volcanic areas - the Cascade Range in the north, and Long Valley Caldera, on the east side of the central Sierra Nevada. 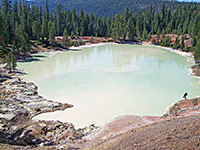 The most exciting and varied site in the Cascades is Lassen Volcanic National Park - not only volcanic relics, like Lassen Peak and the Cinder Cone/Fantastic Lava Beds area, but also lakes, waterfalls, and thermal features, such as Bumpass Hell, Boiling Springs Lake and Devils Kitchen. 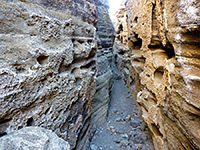 Just north of the park, the Hat Creek region has more volcanic remains including Subway Cave, a smooth-walled lava tube. Moving north, the next Cascade summit is Mount Shasta, classed as an active volcano, with the last eruption occurring about 1800. This iconic, snowcapped peak rises 10,000 feet above the surrounding forests and is visible for over 100 miles in all directions. Beyond here, a third volcanic area is Medicine Lake and Lava Beds National Monument, this latter containing cinder cones, craters, and especially lava tube caves, with over 400 so far discovered. Long Valley Caldera is a zone of volcanism spanning 50 miles between Mono Lake and the north end of Owens Valley; sites include the Black Point Fissures on the north side of the lake, Panum Crater on the south side and Hot Creek Geological Area near Mammoth Lakes - a collection of bubbling hot pools and occasional geysers. 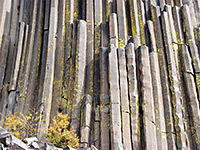 Another unusual volcanic formation lies a little way west - Devils Postpile National Monument contains a rare outcrop of hexagonal basalt columns, beside the San Joaquin River at the edge of the Sierras. 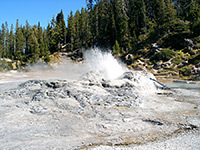 Elsewhere in California are other, scattered volcanic sites including Amboy Crater in the Mojave Desert, Ubehebe Crater in Death Valley, and Pinnacles National Park southeast of Salinas. 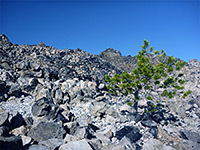 Vast areas of south Idaho are covered by lava, resulting from migration of the North American Plate over a magma hotspot, a site now located under Yellowstone National Park in Wyoming. The best place in the state to see volcanic features is Craters of the Moon National Monument and Preserve, which has a scenic drive, several short trails and one longer backcountry route. Another site of interest is Menan Buttes, a pair of conical volcanic craters adjacent to the Snake River, one open to hiking. 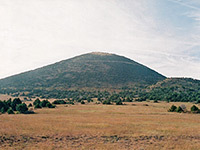 There is much evidence of ancient volcanoes in New Mexico, including three NPS preserves. In the northwest, El Malpais National Monument has large areas of lava flows, several craters and numerous lava caves, while the more remote Capulin Volcano National Monument in the northeast contains the 1,000 foot high cone of an ancient volcano. A short road climbs to the top, and a path circles the rim, for long-distance views over the surrounding flat prairie. Petroglyph National Monument features thousands of ancient drawings carved onto dark volcanic rocks at the edge of a low mesa bordering the west side of Albuquerque, and it includes five small fissure volcanoes. 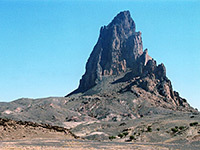 Also in the state is Valley of Fires Recreation Area, covering many square miles of black lava deposits, while in the northeast are various volcanic cones, largest being 1,800 foot high Shiprock, visible for many miles across the Four Corners area. 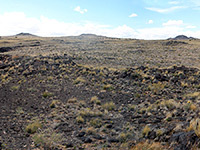 There are nine significant volcanic areas in Nevada, scattered all across the state, of which Lunar Crater is perhaps the most interesting; a collection of cinder cones, lava flows, fissures, ash hills and one big crater, all set in a very remote area 80 miles east of Tonopah. The Cascade Range continues north-south all across Oregon, including dozens of volcanic peaks and extensive lava fields. 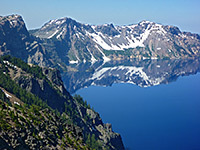 The most spectacular and beautiful location is within Crater Lake National Park - the lake itself, various summits, lava flows and pinnacles. North of here, most of the range is part of national forests and wilderness areas, the other most prominent points being Three Sisters, Mount Jefferson and Mount Hood, all of which are high enough to support several glaciers. 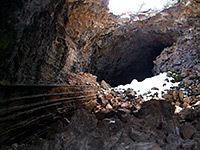 Another collection of lava, cones and caves is part of Newberry National Volcanic Monument, a varied preserve also containing forests and lakes, popular for camping, boating and fishing. 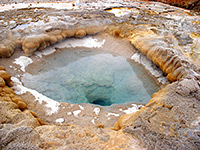 Oregon's desert southeastern corner has both volcanic areas (Diamond Craters, near Burns), and thermal areas - many small hot springs, some surprisingly beautiful, surrounded by the same beautiful sinter deposits as are found in Yellowstone National Park. 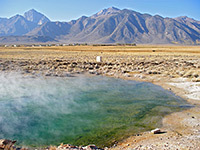 Locations include Warner Valley, Alvord Desert, Hart Mountain and Borax Lake. Volcanic peaks are found in scattered areas of west and central Texas, including some in Big Bend National Park, but none are particularly large or interesting. The state does have two sizeable craters formed by meteorites, one south of Stockton (Sierra Madera), the other (the Odessa Meteor Crater) a little way north. Although 600 feet across, this crater has been filled in by sediments and is now largely indistinguishable from the flat, grassy surroundings. 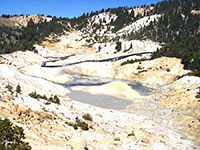 Extinct volcanoes and lava occur in several Utah locations such as the Markagunt Plateau (within Dixie National Forest, east of Cedar Breaks National Monument), the Black Rock Desert in Millard County, and Santa Clara Volcano in the southwest, near St George. 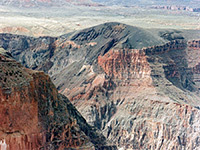 Lava flows, including several lava caves, produced by this volcano may be viewed in the adjacent Snow Canyon State Park. A more unusual crater is found in the Island in the Sky district of Canyonlands National Park, in the southeast. 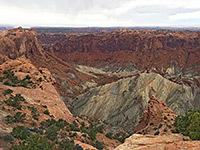 This large, circular depression (Upheaval Dome) filled with distorted sedimentary rocks was once thought to be a salt dome uplift, but is now considered to be caused by meteoric impact. 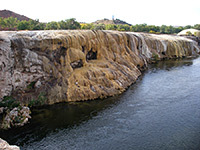 Hot Springs State Park near Thermopolis in west central Wyoming is a small preserve containing several springs beside the Big Horn River, which have produced unusual travertine terraces colored white and yellow. These might be famous were they in a more populous state, but they are dwarfed in scale, beauty and variety by the approximately 10,000 thermal features of the amazing Yellowstone National Park in Wyoming's northwest corner. Together with the spectacular lake, canyon and mountain scenery, and the abundant wildlife, Yellowstone is one of the premier US attractions, despite its remote location and limited opening season, as most is closed by snow for at least five months of the year. 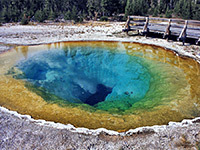 The main thermal areas are at Heart Lake, Mammoth, Norris, Shoshone, West Thumb and the Upper, Midway and Lower Geyser Basins - this latter is home to Yellowstone's most famous geyser, Old Faithful. View all photographs of craters. 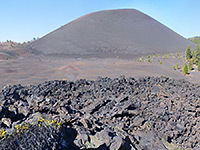 View all photographs of lava. 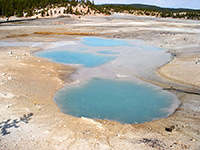 View all photographs of thermal features.